Sorry to upload these shows out of order. This is the first quarterfinal pitting two schools located in North Ridgeville, Ohio, the private school Lake Ridge Academy against the community’s public high school, North Ridgeville High. 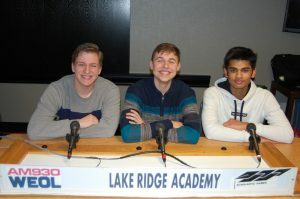 It marks the first time in the history of Scholastic Games that the two schools have competed directly, but this year they were both first-round winners, making for an interesting matchup, scorers facetiously calling it “the battle of the Ridges.” The Lake Ridge team, as pictured left to right, consists of John Harrington, Ryan Rosu, and Sparsh Balababadrapatruni. The academic team from North Ridgeville High School, was represented by, left to right, Aidan Cunningham, Emily Hiles, and Jonah Fechner. Click above to hear the competition or (this is a spoiler) read the final result in our official news release.